1. Make crust: Preheat oven to 350°. Whirl cookies in a food processor until finely ground. Whirl in butter just until incorporated. Pour crumbs into a 9-in. springform pan and press over bottom and about 1 in. up inside of pan. Bake 7 minutes, then let cool on a rack. Reduce oven heat to 300°. 2. Make filling: In a large bowl, with a mixer on medium speed, beat cream cheese, sugars, and flour until smooth. Beat in eggs on low speed 1 at a time. Add remaining filling ingredients and beat until just blended. Wrap bottom of pan with foil, pressing it up the outside. 3. Set springform pan in a roasting pan and pour filling into crust. Pour enough boiling water into roasting pan to come about halfway up side of springform pan. Bake until cheesecake barely jiggles in the center when gently shaken, about 1 1/4 hours. Let cheesecake cool on a rack 1 hour, then chill until cold, at least 5 hours. 4. 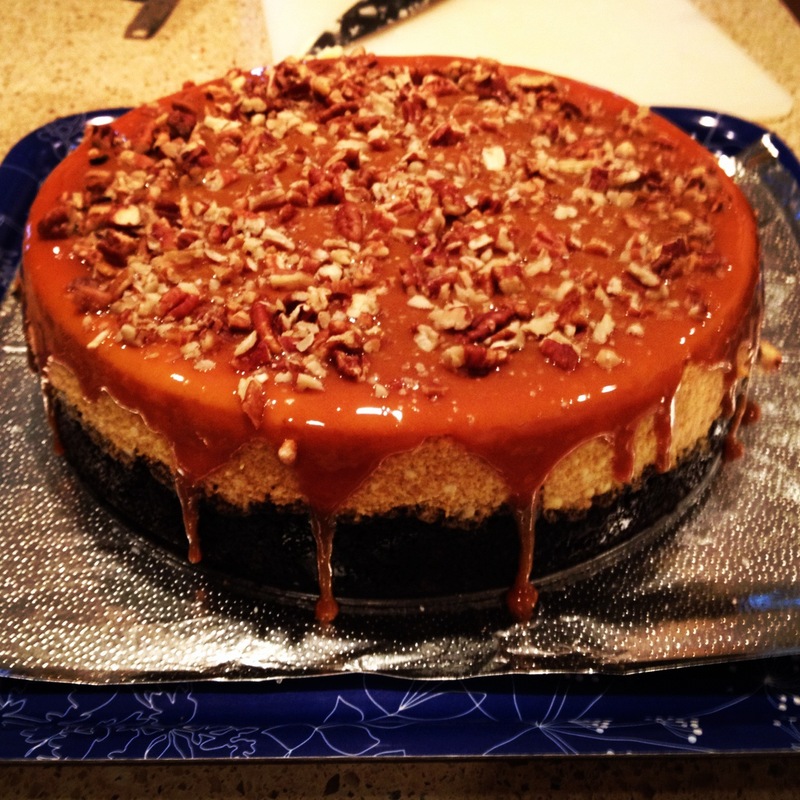 Whisk caramel topping and table salt in a bowl and spoon over cheesecake. Arrange pecans around rim and sprinkle flaked salt over pecans. *Flaked salt has large, hollow, crunchy crystals. Find it at well-stocked grocery stores and online. Note:For a fissure-free cheesecake, beat your filling just until it’s blended–no more. (Too much air in the mixture will make it deflate, and then crack, in the oven.) Find pumpkin pie spice in your baking aisle, or make your own: 4 parts cinnamon, 2 parts ground ginger, 1 part nutmeg, and 1 part ground allspice.